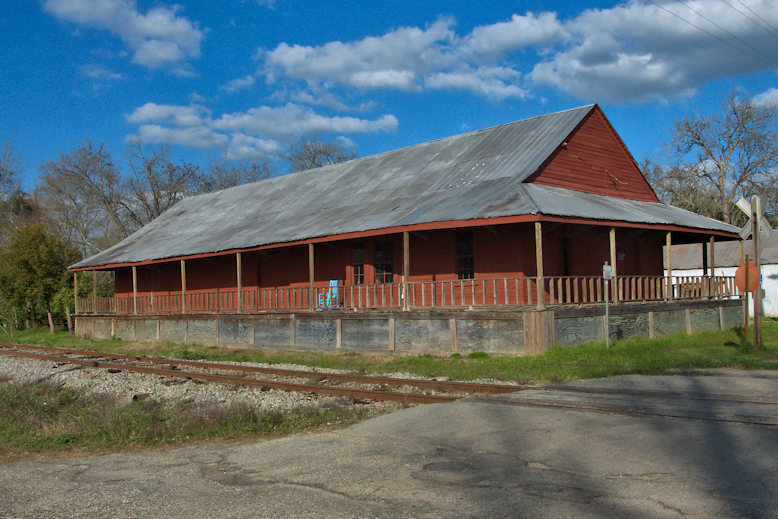 I’ve not been able to find much history regarding the Morven depot, but it appears to be in need of stabilization. It was built by the South Georgia Railway at the end of the 19th century. I hope the town can rally around it and restore it before it’s too late. S. W. Edmondson writes: …The center stake for the town of Morven is supposed to be under the depot. When I was a little boy, about 1941-42, I recall sitting on the depot plaform with my grandfather Enoch Edmondson and Mr. Lester, the station master at the time when South Georgia Railway still ran a small daily train from Quitman to Adel, with stops along the way as needed. Mr. Lester had a huge mastiff dog who growled at me, inducing some fear in a little boy. My grandfather, who always carried a pistol, pulled it out and said he would not let the dog harm me as he would shoot it if it tried. That settled the matter. Charles R. O’Neal, Jr., added: My father. Charles R. O’Neal was the person who drove the survey stake under the railroad depot when he was a small boy. His father, C.R. O’Neal was the Brooks County Surveyor and was laying out the town of Morven in the late 1890’s or early 1900’s…We lived in Tampa when I was growing up and use to go to Morven to see my grandparents. It was a busy place during watermelon season. 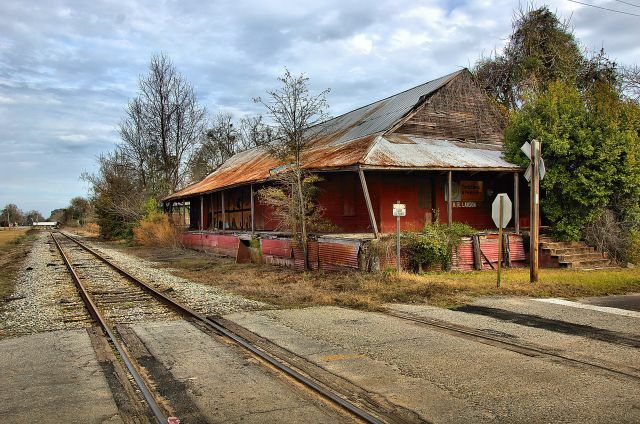 Update (11 May 2016): Cindy Chappell and Linda Cooper both commented on the Vanishing South Georgia Facebook page that the depot is presently being restored. February 2018: The depot has been nicely restored. It’s nice to be able to remove a place from the endangered list. Great job, Morven! UPDATE: I’m very sad to report that the Morven depot was lost to fire on 11 April 2018. The cause is presently under investigation. It is being restored. I have a picture and wish I could post it here. Brenda, you can email it to me at: wbrianbrownATgmailDOTcom and I can add it to the post, with a credit to you, if you’d like. Thanks. Wow…My father Gene Johnston was born in Morven in 1940 and I love this picture. His family left the area and moved to Tampa when he was a teenager, but I can remember coming back a couple of times for him to visit his relatives (Johnstons and Akins). Thanks for posting this! Harmon Lawson owned the depot building the last I heard. He just celebrated his 93rd birthday. The center stake for the town of Morven is supposed to be under the depot. 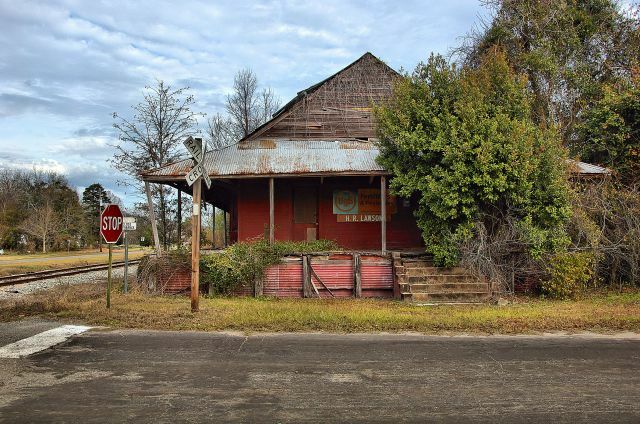 When I was a little boy, about 1941-42, I recall sitting on the depot plaform with my grandfather Enoch Edmondson and Mr. Lester, the station master at the time when South Georgia Railway still ran a small daily train from Quitman to Adel, with stops along the way as needed. Mr. Lester had a huge mastiff dog who growled at me, inducing some fear in a little boy. My grandfather, who always carried a pistol, pulled it out and said he would not let the dog harm me as he would shoot it if it tried. That settled the matter. My father. Charles R. O’Neal was the person that drove the survey stake under the railroad depot when he was a small boy. His father, C.R. O’Neal was the Brooks County Surveyor and was laying out the town of Morven in the late 1890’s or early 1900’s. My father died in Morven in 1988 at the age of 95. We lived in Tampa when I was growing up and use to go to Morven to see my grandparents. It was a busy place during watermelon season. My parents moved back to Morven in 1965 and stayed till dads death in 1988.